It is a myth that pregnant women have to eat for two during pregnancy. 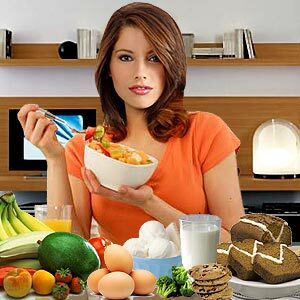 The fact is a pregnant woman should eat nutritious food to ensure healthy growth of the fetus. Weight gained this way can be easily shed post-delivery. When pregnant, women can consume 100-300 calories more than their normal requirements. Gaining weight steadily and within healthy levels can help in reducing stretch marks, shortness of breath, hemorrhoids, indigestion etc. It is advisable that every woman talk to her healthcare provider on how much weight she should gain during pregnancy. There are no strict guidelines for healthy weight gain during pregnancy. Healthy weight gain can be calculated based on the BMI of a woman. The main reasons cited for excess weight gain during pregnancy are pregnancy food cravings and unhealthy eating habits. It is also not advisable for women to starve while pregnant for the fear of gaining weight. They should instead focus on eating healthy and nutritious food while avoiding high calorie and junk food. Each woman is different - based on her existing body weight; she may have to gain more or less weight. It is advisable to talk to your health care provider and follow his/her suggestions. Also remember healthy weight gain varies for each pregnancy. It is better to gain weight steadily during your pregnancy. But you might notice a couple of growth spurts. As long as you keep an eye on overall weight gain, you will be well within acceptable weight gain during pregnancy. Gaining too much or too little weight can be detrimental to your newborn. Women who have not gained much weight during their pregnancy are likely to face increased risk for low birth weight babies of less than 5.5 pounds. This can lead to development problems and sometimes infant mortality. Pregnant women generally gain 1 pound per month during the first trimester. Pregnant women usually gain most weight during the second trimester. Once they are through with the morning sickness and other discomforts of the first trimester, they begin to eat better. It is at this stage that they must exercise caution and eat healthy and balanced foods. Typically there is minimal weight gain from the 35th week of pregnancy. There is usually no weight gain after the 38th week. Remember that this is surely not the time to embark on any diet plans.